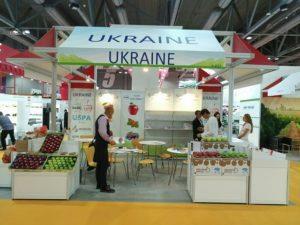 This is the third participation of Ukrainian companies led by the UKRSADPROM association as part of its market diversification strategy for fruit and berry exports Hall 5d / R27. Many products (apples, cherries, berries, ...) presented by companies that have all been selected according to several criteria: experience in the export of fresh fruit, obtaining a GLOBALG.AP certificate, production volumes and use of appropriate methods (automatic sorting, packaging, quality control). The participation at the show last year was considered beneficial, contributing to the increase in fruit export volumes. The stand features apples, cherries, berries and other products grown in Ukraine.